... encourages children to pursue a career in conservation based activities. 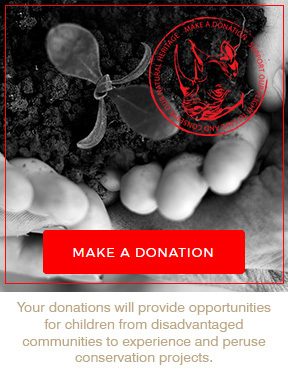 The Gondwana Conservation Foundation has an ultimate goal of exposing over 200 children a year, from predominately underprivileged backgrounds, to active conservation projects within the Western Cape. The program currently allows children to experience a full day in a conservation area where they learn about the natural environment and how they can contribute to conservation projects in their every day life. The program provides the children, often resident on the periphery of conservation areas, the opportunity to see what is being done within protected areas and encourages them to pursue a career in conservation based activities. Key children that express interest in the program will have the opportunity to participate in overnight weekend long programs on Gondwana Game Reserve in the near future.